This post has been sponsored by Udi’s®. All thoughts and opinions are my own. Chia pudding gets topped with clusters of Udi’s® Gluten Free Vanilla Granola from my local Walmart, plump blueberries and a blueberry jam for a fresh and filling breakfast idea. It’s so easy to make and is great for meal prep. If you’re like me, you’re always on the go from one activity or appointment to the next. I find myself always in search of gluten free breakfast recipes that are tasty and filling so that I’m not starving two hours later. I always find breakfast to be one of the roughest meals of the day. As someone who has celiac disease and also doesn’t tolerate dairy or eggs well, it’s hard to find a breakfast that is filling and tasty. 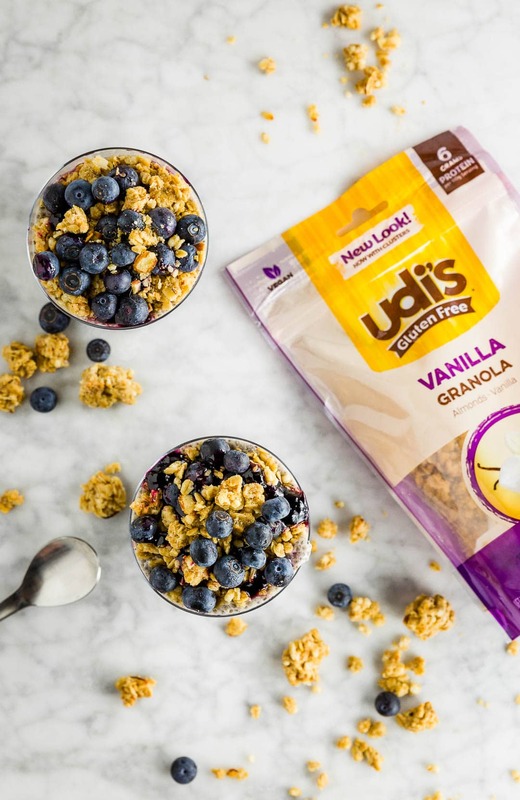 While coconut yogurt with Udi’s® Gluten Free Vanilla Granola is my typical go-to for easy breakfasts, I like to change it up every once in awhile. That’s where chia pudding comes in. Just top Udi’s Gluten Free Granola on chia pudding with some fresh blueberries to fuel up for your day. It’s so simple but packs so much flavor! Plus, the granola has 5-8g of protein per serving! I also love serving this chia seed pudding with granola for brunch with family and friends. It makes a delicious side for omelets, but it’s also a terrific option for those who are dairy-free or vegan as well. Plus, look at how gorgeous it looks layered in a glass! 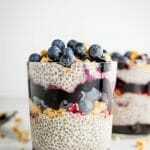 What is Chia Seed Pudding? If you haven’t tried chia pudding before, you’re in for a treat with this version topped with Udi’s Gluten Free Granola! 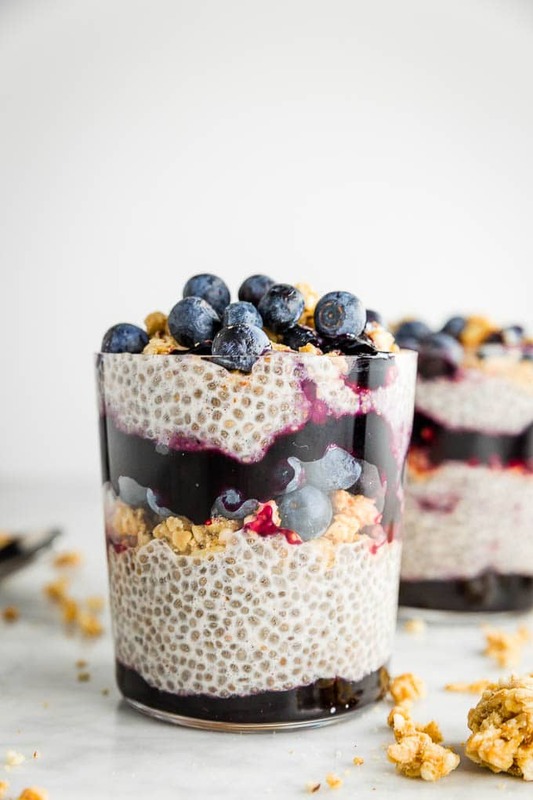 Chia pudding is essentially just some type of milk (usually non-dairy) and chia seeds whisked together and left to sit for a few hours, preferably overnight. It has a similar consistency to tapioca pudding or overnight oats, but the chia seeds do all the work here. It makes a great breakfast, snack or even a dessert! I’ve found that I like the consistency best for chia pudding when I use 1/4 cup chia seeds for every cup of non-dairy milk. It’s thick and creamy, with just the right amount of chia seeds. When left to sit in the refrigerator to thicken, the chia seeds become gelatinous and soak up the liquid. So while it may seem like you’re adding too much liquid when you’re preparing, once left to thicken, the chia seeds will absorb the milk. What Type of Milk is Best for Chia Pudding? Chia pudding is made with any non-dairy milk, but I’ve found that some types of dairy-free milk work better than others. If you’re looking for a thick and luxurious chia pudding, try out canned coconut milk. It’s my favorite way to make chia pudding! Often times, I end up using almond milk for my chia pudding because I always have it on hand. While it doesn’t create as thick of a chia pudding as coconut milk, it is a terrific option for easy meal prep breakfasts. Other milk options that you can use are cashew milk, soy milk, hemp milk, oat milk or even regular cows’ milk. However, if you’re using a milk that is already sweetened, you may not need to add as much maple syrup to this recipe. What Makes This Chia Pudding Gluten Free? Chia pudding in itself is typically gluten free, as it contains chia seeds, a non-dairy milk, and a sweetener at its most basic form. However, since this chia pudding has granola, use Udi’s Gluten Free Granola to make it gluten free! Udi’s recently reformulated its granola to improve the taste and texture, using the same simple ingredients. The granola now has more clusters, which are perfect for topping this chia seed pudding. You can find Udi’s Gluten Free Granola in the cereal aisle at Walmart! For this recipe, I used Udi’s Gluten Free Vanilla Granola, but there are new flavors like Almond Butter, Chocolate Coconut and Apple Cinnamon that I think would be great on this chia pudding, too! Udi’s Gluten Free Granola is certified gluten free, so you can feel good about eating it if you’re on a gluten free diet. It’s also wheat, dairy and soy free if you have other allergies or intolerances, too. Not only is it amazing on this chia pudding but it’s great with a splash of almond milk for breakfast or as a mix-in for your favorite trail mix. Can I Use Other Fruit for this Chia Pudding Recipe? You bet! I used blueberries paired with a blueberry jam for this recipe. However, you can use whatever fruit combination you would like. Strawberries, raspberries and blackberries are good choices if you like berries. Fruits like peaches, pears, plums, and kiwi are great, too! If fresh fruit isn’t available, try dried fruits like dried cranberries or blueberries. Change up your jam with some lemon curd or apple butter to suit your taste. The flavor combinations are endless! Can you just imagine diced apples, apple butter and Udi’s Gluten Free Apple Cinnamon Granola paired together with a cinnamon chia pudding? YUM! You’ll love how easy this chia seed pudding with granola and blueberries is to make. Whether you need an easy meal prep solution for breakfasts or are serving an elegant brunch, this chia pudding with granola is the perfect recipe for you! 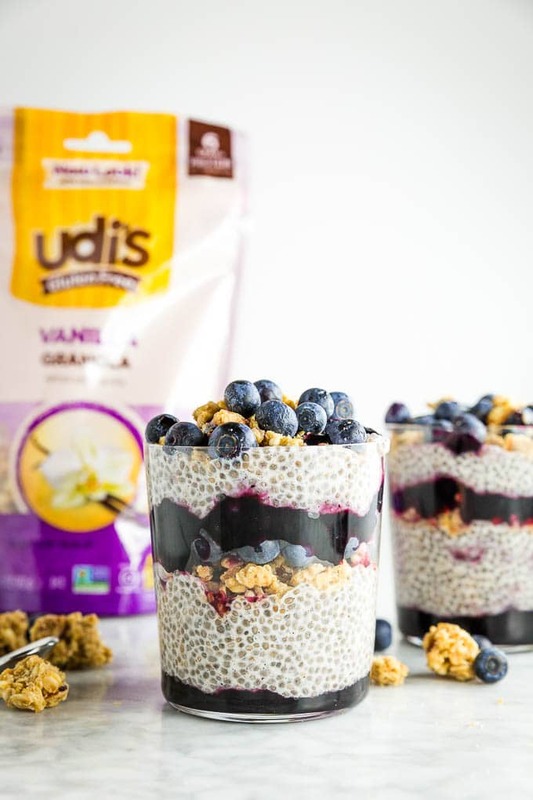 Chia pudding gets topped with clusters of Udi's® Gluten Free Vanilla Granola, plump blueberries and a blueberry jam for a fresh and filling breakfast idea. It's so easy to make and is great for meal prep. In a medium bowl, combine non-dairy milk, maple syrup, vanilla extract and cinnamon. Whisk to combine. Stir the chia seeds into the milk mixture. Cover the bowl and place in the refrigerator. Refrigerate for at least 4 hours, preferably overnight. 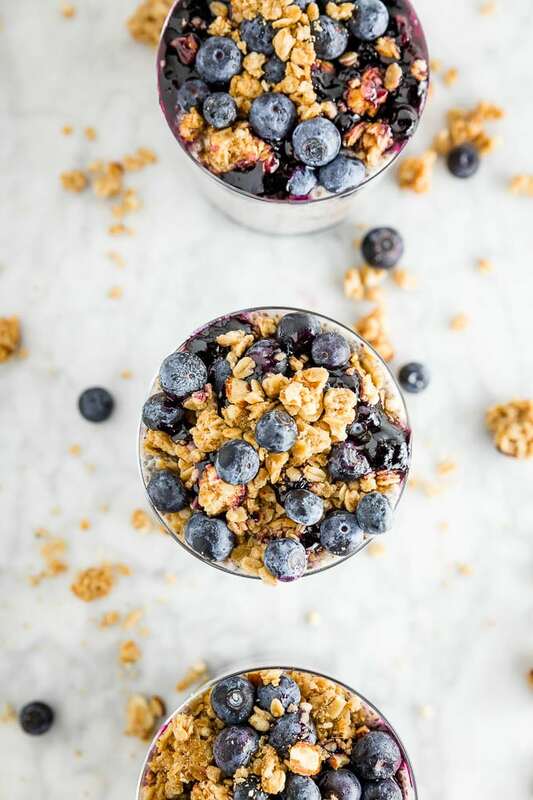 When ready to serve, layer blueberry jam, chia pudding, Udi's® Gluten Free Vanilla Granola, and fresh blueberries in a small glass. Keep leftovers in a covered container in the refrigerator for up to 4 days. It looks delicious! I will try that tomorrow!